[miau] Slot machines can be so dull. If you are someone who frequents casinos you know your attention is pulled in one million different directions as you enter and it definitely takes an enticing slot machine to pull you in a certain direction. Game tables are everywhere, flashing lights, ringing bells – casinos offer a complete overload of external stimuli. So, how does a slot machine go about grabbing your attention when it is amongst so many other noisy and dazzling slots competing to grab players’ attention? It is tough. 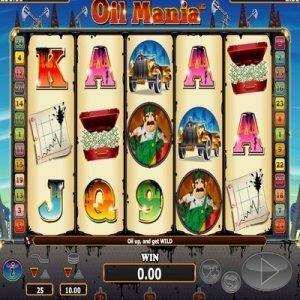 There are definitely certain slot machines that out-do the others – Oil Mania is one of them. First, Oil Mania is aesthetically pleasing – casino guests are immediately drawn to it. The game is displayed through bright colors and fun sounds – attracting at least a glance from everyone who walks by. More over, in some weird, farfetched way it seems to put a modern spin on the classic Oregon Trail game so many people know and love. It’s the old West and the player is after black and gold! No, not the Pittsburgh, Steelers – oil and gold! The game displays 25 game pay lines on the screen. In order to make sense of all of those play lines the players’ winning combinations are easy to spot through neighboring lines. Having the winning combinations adjacent to one another allows the player to view them more easily. The players winning combinations will display from left to right. And the best part? The player only needs two bordering symbols in order to create a winning pair! The symbols are fun too. There is an Oil Worker, a map, a car, and of course there is a bag of money. The game doesn’t stray too far from what we think of as conventional gambling though. Classic symbols from a deck of cards like, Jack, Queen, King and Ace are also used. Running out of spins isn’t on the top of the players’ mind when playing Oil Mania. The slot offers bonus spins to players and chances to win a lot of oil and gold! What does winning a lot of oil and gold mean? It means winning a lot of money! The bonus spins are exciting to new players and seasoned players alike because they are so unexpected. Three free spins are always given and the player has the chance to watch their oil rise. In order to be given the bonus spins a bonus symbol just needs to appear anywhere on the players’ reel. It does not have to be next to another symbol or to the left or to the right of another. The game is very straightforward and really does provide plentiful opportunities for players to win money. After all, that is what slot games are all about – easy money and entertainment! Next time you find yourself walking into a casino and lights overwhelm you and sounds are coming from every direction – just listen closely for a soft banjo and when you hear it you will certainly see the bright symbols crowded by grey oilrigs in the distance. If you are lucky enough, you will strike oil! Unlike the oil tycoon you will not have to get your hands dirty!